At AutoStream Car Care Center, we’re big believers in supporting our local communities. We’ve been involved in a number of initiatives over the years that have allowed us to connect with members of our community and help support some really great causes and organizations. 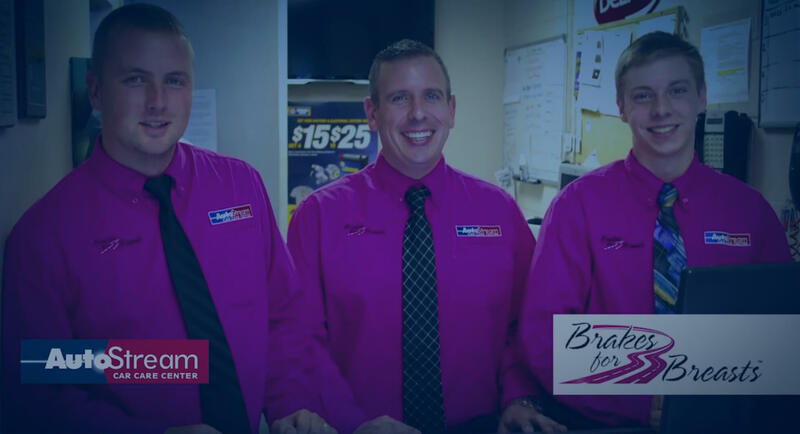 Many of our initiatives, such as our annual participation in Brakes For Breasts, have been successful largely due to the participation of our customers – and we’re grateful for your support! Below are some past and current community initiatives that AutoStream Car Care has been proud to support. event here. To celebrate our 20th anniversary and thank the community who supports us, AutoStream is hosting a fundraiser for Make-A-Wish® Mid-Atlantic. We’re offering customers a discount on any oil change in May 2019 AND donating $5 for every oil change performed. Help us support Make-A-Wish® Mid-Atlantic so they can serve more critically ill children in our communities. AutoStream Car Care has participated in the annual Brakes For Breasts fundraising event for the past several years, which raises money to support the Cleveland Clinic Breast Cancer Vaccine Research Fund. Thanks to our loyal customers, we were able to donate over $4,500 to the Cleveland Clinic in 2018 – our largest Brakes for Breasts donation to date! Read more about this fundraising. AutoStream Car Care is proud to support our local police department on the police unity tour. The police unity tour is a 275-mile bike ride and fundraiser for the National Law Enforcement Officer’s Memorial and Museum. AutoStream is proud to support the Howard County Police Pace as a Dispatcher sponsor. To learn more or sign up for the race, visit www.policepace.com. Driving Students Success is an after school ride program which enables underprivileged students to participate in extracurricular activities, something that has been shown to improve overall academic performance. AutoStream Car Care is excited to partner with Howard County Public Schools to support Driving Student Success. Driving Student Success supports extra after hours school buses in order to expand the number of students able to attend programs to enhance and enrich academic achievement. Read more about this new initiative here. In an effort to give back to the teachers in our community, AutoStream Car Care offers a 10% discount to all Waverly Woods Elementary teachers, staff and families. In an effort to give back to the teachers in our community, AutoStream Car Care offers a 10% discount to all Celebree Learning Center’s teachers, staff, and families. We’re a proud sponsor of the Mustang 5K Stampede and 1 Mile Zombie Walk, which benefits the Marriotts Ridge High School Boosters Club, supporting student clubs, sports, and extracurricular activities. AutoStream Car Care was proud to help support fundraising for the library by offering a number of VIP cards to be used as raffle prizes in a fundraising event. Some of our AutoStream Car Care Centers have Subway restaurants onsite, and we’ve been proud to partner with them every October in asking customers for $1 donations to help support the American Cancer Society. We proudly display the names of contributing customers on a pink ribbon on the walls of our Subway restaurants. We’ve had the opportunity to work with Mary Kay in donating care packages to soldiers overseas, as part of the Operation Mary Kay Program. We do our best to welcome new community members with welcome packets, which we’ve distributed to a number of places in our community, including Shomrei Emunah, Ariel, Suburban Orthodox Synagogues, Independent Jewish Academy, Bais Hamedrash, Mesivta of Baltimore, Bais Yaakov, Winter High School and more. In partnership with ATI, AutoStream Car Care is honored to support Kids Beating Cancer whose mission is to provide life-saving treatments to children diagnosed with leukemia, lymphoma and 80 other cancers. Together we believe that science is the cure and Kids Beating Cancer works to ensure every child has access to necessary treatments.